made largely from the natural resins of wood itself. That is how and why it cures paint failure. This is Science. I, Steve Smith, a Scientist, invented this. No other product uses my science. The science is why it works. "MultiWoodPrime is great for sealing old wood ... Effective, reasonably priced, good customer service, timely delivery. (The product) works." MultiWoodPrime is the New Wood/Millwork brand name for Smith's Clear Penetrating Epoxy Sealer™ (CPES™). CPES has been highly regarded for forty years by the structural restoration community, primarily because of its ability to restore existing wood members by impregnation of the apparently sound wood near regions of visible decay. In many cases it eliminates the need for costly replacement. A secondary benefit, however, was discovered when CPES was used for wood restoration: CPES was functioning as a high grade adhesion-promoting primer as well, and the paint/stain/varnish top coatings that had been applied were not failing as they usually did. Thus began the specification of CPES as an adhesion-promoting primer by architects and high-end contractors. Finally, word of mouth brought many a local homeowner to the manufacturer's door, asking how and where they could buy CPES for their own home repairs. The chemist who originally formulated CPES had always known that it was a superior primer and why; he had not, however, realized that so many consumers were now using it solely as a primer on new wood. Bottom line, the feedback from state architects, millwork manufacturers, and people who had the opportunity to witness years of superior topcoat performance after CPES had been applied, led Smith & Co. to market their Clear Penetrating Epoxy Sealer as a multi-purpose-primer as well as for wood restoration. The reason: There is no primer available anywhere, not through specialty suppliers or retail outlets or any other, that functions as an adhesion promoting primer, a porosity-sealing primer, a tannin-blocking primer, an acidity-neutralizing primer and a sanding-primer, (as well as resisting long-term coating failure) all-in-one - thus the new brand name MultiWoodPrime™. MultiWoodPrime is a tough, flexible resin system carried into the wood by a solvent blend which dissolves the sap, oil and moisture found in wood. The resin system is derived from natural wood resin and, therefore, develops a chemical adhesive bond to the wood resin and wood fibers in the new wood. The resins from each form a bond which prevents coating adhesion failure. The name MultiWoodPrime means what it says: it is a multi-functional primer, a claim meant to be taken by the user literally. MultiWoodPrime, in fact, performs the multiple functions of promoting topcoat adhesion, neutralizing wood acidity, sealing surface porosity, impregnating sub-surface porosity, blocking tannin bleed, resisting coating failure, and toughening up a soft surface so it can be lightly sanded. "I have used it (MultiWoodPrime) on (boat) bottoms as well as almost everything else. It does two things very well. Firstly it soaks into the wood, gluing the grain together and taking up space so water can not. Secondly, because it is 'part of the wood' now it is the perfect 'primer' or paint base." R. W.
Why Aren't Other Primers Effective? Historically, a simple lead carbonate oil-based primer [White Lead] worked well on slowing-growing dense old-growth wood because the lead carbonate also functioned as a mild, but effective, fungicide. We all know government regulators removed the lead from all paint, but that wasn't all that changed. Concurrently the lumber industry developed fast-growing trees, and their wood was much more porous than the slow growing types. The industry-standard euphemism for this is "Second-growth" lumber. (In a way, it is similar to the difference between domesticated and wild animals; the wild ones are in many respects better-adapted to survive.) Lastly, latex paint replaced oil-based paint, with the latex paint manufacturers claiming their latex product could be used directly on wood as a primer, as well as a topcoat. After these three changes took place, consumers found their wood rotted more easily, paint did not prevent rot, and when rot developed under the layer of paint, the paint separated from the wood. MultiWoodPrime, as opposed to other primers on the market, provides the ingredients needed and/or missing in common primers which fail to keep paint stuck to the wood after one or a few years. In this way MultiWoodPrime compensates for today's highly porous wood. Wood impregnated with MultiWoodPrime changes the natural wood cellulose (which fungi and bacteria find tasty and easily digestible) into epoxy-impregnated cellulose, which tastes bad to them and resists further attack by fungi and bacteria. The wood is also reinforced by the gluing together of the internal and surface wood fibers, while continuing to allow the wood to breathe. As a result the wood resists the natural deterioration process which leads to paint failure, especially if the paint is a waterborne product. New, "Second-growth" wood is similar to old, weathered wood in that it has a porosity which can absorb the vehicle-portion of some coatings, leaving the mineral-and-pigment-portion of the paint formula deposited on the surface as a brittle, mineral-packed layer. This film eventually cracks and the latex primer's seal is broken. MultiWoodPrime will not crack. The reason MultiWoodPrime will not crack is because the very thin film of epoxy glue on the surface continues to cure after the topcoat is applied, bonding the top coat to the primer (and remember, the wood-derived resins in the MultiWoodPrime have already bonded to the natural resins in the new wood). In other words, the paint becomes glued to the wood. The glue is a flexible glue made largely from the resins of wood itself thus remains about as flexible as the natural wood. MultiWoodPrime is designed to impregnate wood. Therefore it has an extremely low viscosity, meaning it runs like water. Virtually all of the product goes into the wood, gluing the fibers together. 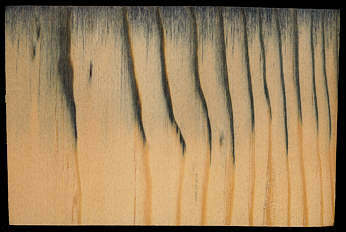 Wood absorbs more from different directions, as the following pictures show. Therefore, total immersion of the wood is optimal. In some cases immersion is not viable, such as when the individual components of the millwork have already been assembled. Surface application by brush or roller will still extend the life of the wood product by years and outperform any primer presently on the market. Spray application is discouraged because of ingredient evaporation. However, if it is necessary to spray MultiWoodPrime, the user should contact Smith & Co. A sprayable formulation is available on special order. Business Profit From Using MultiWoodPrime. Extreme end grain porosity makes wood very prone to rot due to the ease and depth with which water may be absorbed into millwork such as doors and windows, bath vanity cabinets and kitchen base cabinets. This can reflect unfairly on the millwork manufacturers, the finishers, and the top coating products specified, when in fact the real problem is caused by the limitations of common paints/primers and the characteristics of modern lumber. By reducing, even eliminating costly returns and field failures in spite of having to use modern coatings on modern "Second-growth" lumber, business profit is increased. In some cases it may be possible to eliminate some other additional "primer" under a topcoat, and apply MultiWoodPrime to the wood and then a topcoat. This will give increased quality at the same or even lesser cost, depending on production requirements. 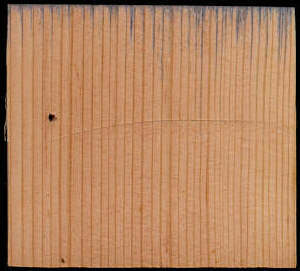 If a topcoat is to be applied directly over a primer in the least production time, an oil-base enamel topcoat will be able to be applied over MultiWoodPrime sooner than a latex, and with a high level of drier [curing catalyst] in the enamel one can see handling film strength sooner than with a latex, whose film-forming properties depend on both temperature and humidity. This improvement in production efficiency translates into business profit. A second primer, specifically an oil-based primer, is often desirable as a moisture-diffusion barrier primer for exterior installations or high-humidity interior applications if using a latex (waterborne) topcoat. The highest performing exterior coating system would be a coat of two-part epoxy MultiWoodPrime on the bare wood, then an application of oil-base primer, and lastly a latex topcoat in the desired color and appearance [flat, satin, etc.]. Mix equal parts of components A and B by volume, mixing only the amount one expects to consume within the hours of pot life (experience will allow you to estimate how fast your wood is absorbing MultiWoodPrime and/or how much coverage you are able to complete within what timeframe). Application may be by brush, roller or immersion. As previously mentioned, spraying is discouraged, but if the application must be sprayed, call Smith & Co. before ordering. Some Oil-base paint/stain/varnishes can be applied within a few hours, while others may need a few days . Twenty years ago most coatings were not so sensitive to residual solvent content in the wood, but with every revision of volatile-organic-content regulations, manufacturers were forced to develop new formulations with more inherent liabilities. When applying waterborne topcoats, it is usually wise to wait a few days for the solvents in MultiWoodPrime to evaporate out of the wood (if the solvents have not evaporated and the latex topcoat is applied too soon, there is a possibility of blistering). A painting contractor or homeowner can normally wait until the next day to apply the top coating. Millwork fabricators will want to work more quickly and will have to test MultiWoodPrime on the specific type of wood being used as the wood's porosity will affect how long they need to wait before applying a topcoat. For more information, read How to use MultiWoodPrime. MultiWoodPrimeMultiWoodPrime Cold Weather Version is designed to be used in cold weather or unheated shops, where the day-to-night temperature range is low. The Warm Weather Formula is designed for higher temperature ranges and immersion-tank application. MultiWoodPrime is available in its Original Formula (600g/l) and (on special order) a VOC-Compliant formula for use in California or other areas where Wood Products Rules limit the Volatile Organic Content [VOC] of coatings to 550 g/l. It is considered a Sanding Sealer under those rules, and meets Regulation 8 Rule 32 of the California Bay Area Air Quality Management District [BAAQMD] and corresponding Rules of other AQMDs for their 550 g/l limit. A 275 g/l version is sold for use within the South Coast Air Quality Management Disctrict (SCAQMD). All versions are considered Sanding Sealers. If there is no AQMD category for Sanding Sealer, it is considered a Waterproofing Sealer. The name "MultiWoodPrime" and the statements "Creates Coating Adhesion", "The Primer with Integrity" and "You can depend on it to bond your coating to the wood", all these are Trademarks and Servicemarks owned by Steve Smith and used by permission. When is the wood dry enough for MWP? Please call for store locations.